I posted a tortilla recipe a few years ago. Now I am back with an even better recipe. This is super easy, and only takes a few minutes to make the dough. 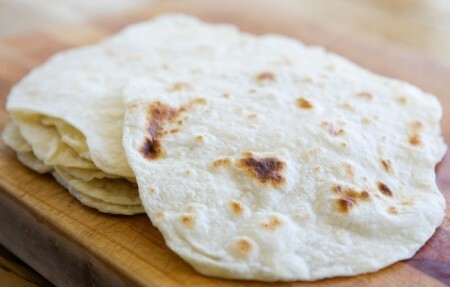 After the dough rests, the resulting tortillas are soft and do not crack when folded. What I like most about this recipe over the old one I posted is that these can be stored in the fridge and don't dry out. Now, all I need is someone to teach me the trick of rolling out round tortillas! Cut cold butter into 1/2 inch cubes. Using a pastry blender or two knives, incorporate the butter into the flour until you can no longer see chunks of butter. Mix in the lesser amount of hot water, mix it together and add more water as needed for the dough to come together. Roll dough onto a floured surface and knead just a few times, adding a little flour if it is overly sticky. You don't want to add much flour as it will make the dough tough. Depending on the size of tortilla you like, you can divide the dough into 8-12 equal sized balls. I made my soft taco sized tortillas by dividing the dough into 10 balls. Cover the dough balls with plastic wrap and let sit for 30 minutes before rolling out. Although you can roll them out right away it is best to let the dough rest, so that the gluten relaxes making it easier to roll out. Roll out one dough ball at a time. Keeping the other dough covered as you work. Place the tortilla in an ungreased hot pan and fry each side for about 30 seconds. Wrap the tortilla in a clean towel to keep it pliable and warm as you cook the other tortillas. Once cool, any unused tortillas can be wrapped tightly in plastic and stored in the fridge. I like to separate each tortilla with parchment paper and put them in a plastic bag and freeze them.